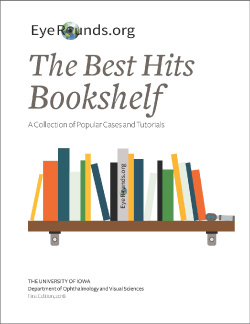 This first edition is a compilation of 50 case and tutorial articles featured on our website, EyeRounds.org. These articles have the most online “hits” as of February 2018 and were hand-selected for their popularity and impact. They are among some of our most recent and high-yield content. Popularity will, of course, change over time and new cases and tutorials are added over time, so future editions will contain a different mixture of articles. Ophthalmology Grand Rounds and EyeRounds.org is a website of the University of Iowa Department of Ophthalmology and Visual Sciences in Iowa City, Iowa. On EyeRounds.org, you will find case reports from our daily morning rounds, high-quality atlas images, videos, and online tutorials. EyeRounds.org is an ever-growing resource for students, residents, physicians, and patients. Over time, EyeRounds has gained momentum, now impacting learners all over the globe. Daily, the website receives thousands of hits from over 40 countries. What is not in this book? EyeRounds.org atlas images and videos, though very popular with our users, have been excluded from this compilation due to their nature. We invite you to explore the EyeRounds atlas at EyeRounds.org/atlas where you will find hundreds of pages of interesting and educational short items with images of interest. EyeRounds videos can be found at EyeRounds.org/video. Videos have been collected from a variety of sources created over the years by residents, faculty, and fellows of the University of Iowa Department of Ophthalmology & Visual Sciences. The content on EyeRounds.org is produced by our physicians and is intended for medical students, residents, and physicians. Content is made available for review purposes only. Much of the material from EyeRounds.org is gathered from Grand Rounds presentations. The intent of Grand Rounds is to initiate discussion and stimulate thought, as a result, EyeRounds articles may contain information that is not medically proven fact and should not be used to guide treatment. Opinions expressed are not necessarily those of the University of Iowa, the Carver College of Medicine, nor the Department of Ophthalmology and Visual Sciences. EyeRounds.org is partially supported by unrestricted funds from The University of Iowa Department of Ophthalmology and Visual Sciences and from The Iowa Eye Association, neither of whom have influence on the content of this site. Patricia (Trish) Duffel has a B.S. in Pharmacy from the University of Texas, Austin (1976) and an M.A. in Library and Information Science from the University of Iowa (1991). Having earned her pharmacy degree in the days before the Pharm D degree became generally accepted, Trish is a registered pharmacist (RPh). Since 1991, she has been the solo librarian for the Department of Ophthalmology and Visual Sciences at the University of Iowa and the Executive Director and Editor of EyeRounds.org since 2007. In her almost 27 years in the department, she has held many roles including library manager, literature searcher, information chaser, newsletter writer/editor, copy editor, webmaster, and educator. Trish goes above and beyond, working tirelessly to support and see to the success of residents, fellows, scientists and physicians in the department. Her powerful work ethic, contagious energy, can-do attitude, and unwavering devotion to those around her has made her a favorite among faculty and trainees. She is a treasure trove of knowledge, a forever learner, and a truly incredible human being. For all that she has done for education at the University of Iowa Department of Ophthalmology and Vision Sciences and EyeRounds.org, we dedicate this work to Trish.